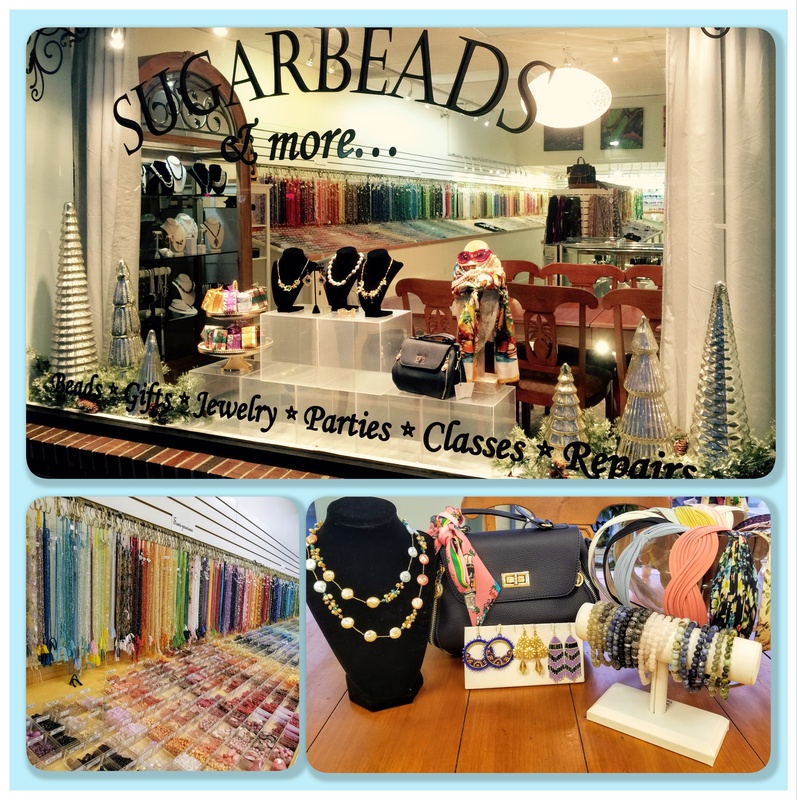 Sugarbeads is an artisan boutique and bead store in Ridgefield, CT. We offer an incredible selection of designer jewelry, gifts, quality beads and jewelry making supplies. What makes Sugarbeads so special and different? Sugarbeads isn’t just about shoppping (although we make that very easy to do!) We are also a jewelry-making studio. Whether you are a professional jewelry maker or just getting started, at Sugarbeads, you’ll find a place to have fun, relax and experience the joy of creating something you love. Our atmosphere is warm and friendly and we want you to make yourself comfortable at our beautiful design table and enjoy complimentary use of our design boards, reference guides and tools anytime you visit. We offer daily beginner and advanced classes, private lessons and consultations. No time during the week? Our weekend workshops are available for kids and adults. You can book an event or birthday party, too! Whether you are looking for beads and findings that are precious and semi precious, silver or gold, crystal, glass, wood or handmade, we probably have what you’re looking for. (And if we don’t, we’ll try to get it for you!) At Sugarbeads, there is something for everyone, from novice to accomplished professional. Our dazzling space has a rainbow of color on every wall with over 5,000 types of beads to choose from! IF IT IS BROKEN, WE FIX IT! From simple to elaborate, we are here to take your tired and worn-out necklaces, earrings and bracelets and give them everything from a professional makeover to a simple repair. We can fix those broken links and clasps, untangle those delicate chains, find and replace missing pieces and restring those strands. Just bring your jewelry in and we will make it happen! Looking for that special gift? Browse our colorful boutique to find stunning jewelry in every style and price point! You’ll love and be inspired by our exquisite designer jewelry made with the finest materials and techniques. We also carry stylish accessories, scarves, hair ornaments, hand bags and more. Sugarbeads is an all-time favorite spot for parties for kids and adults. Our talented and enthusiastic party staff promises to make your event or celebration fun and creative ensure you and your guests have a wonderful time. Book a party at Sugarbeads and make some beautiful memories! Sugarbead’s talented artisans have the skills and experience to make your jewelry ideas come to life! Whether you want an elaborate wedding piece, something for a formal event or a stylish casual design, we will make your jewelry just the way you want. Not sure what you want? We are happy to work with you and help you define your style! TAKE A CLASS OR EVEN A PRIVATE LESSON! Our talented staff is here to teach you what everything you need to know about beading and jewelry-making, whether you are just getting started or want take your skills to the next level. We offer group classes, a private lesson especially for you and our ever-popular weekend workshops, all available for kids to adults!